Sometimes you can judge a book by its cover, and with Claybook you get what you’d expect. You see, there is this book filled with levels made out of clay that allow you to create your own world. The game gives players the freedom of creativity while playing in a world with clay physics. The game’s unique art style and presentation definitely caught my eye as I looked at screens, but can the game live up to the promise of creating levels out of clay? You start the game as a simple ball of clay, where you can roll around with the press of the analog stick and roll over other pieces of clay to get bigger with a simple press of a button. You’re able to morph your clay into four different shapes, as well as take over any masses of clay you find in a level. If you find out you’ve made a mistake, you can rewind time to get yourself out of a sticky situation. It’s easy to move about the world and the game heavily encourages creativity and offers up enough content to keep most gamers busy for many hours. 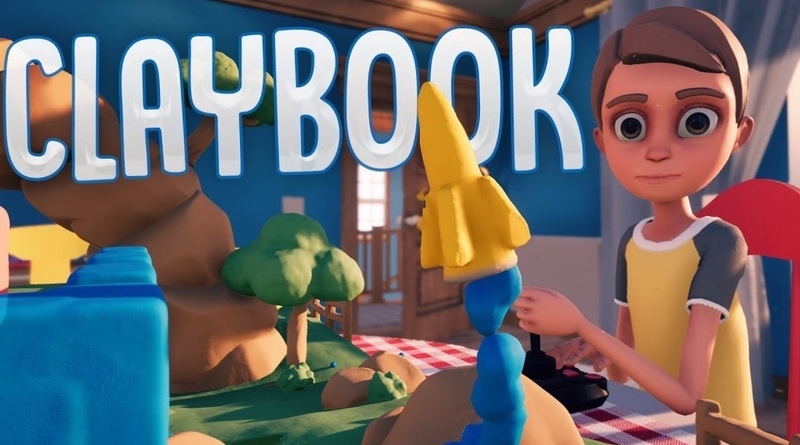 Storybook mode is where you’ll explore different books to complete various tasks that will give beginners a better understanding of how to play the game. It’s a good way to become acquainted with the various controls and to get into the mindset of how to create objects out of clay. Each level offers up a new gameplay mechanic and by the end you’ll know all sorts of tricks of the trade to create all sorts of things. Don’t worry though, you won’t be inundated with walls of text or boring tutorial nonsense, most of the learning is taught organically by actually doing the work yourself. By far the highlight of this game is the Creative mode. At first glance it can appear daunting, including creating your own book, filling out the background and chapters yourself. Hopefully it won’t scare too many players away, because this process can be quite fun. Once you get into the level editor itself it can be a bit scary with all of the options on the screen to choose from. There’s a ton of tools and stuff to use here and it’s sort of like the first time you use Photoshop or Super Mario Maker – the best way to learn is to often just experiment. It will take some time to learn the menu layouts, what options do what, and coming to grips with the controls before you will be able to craft a good level. While this mode takes some time to learn, it is very much worth the effort. This game encourages creativity, and it gives you the tools to back up that encouragement. You can select a variety of preset shapes to add to your level, or you can create your own. You can adjust the gameplay by setting objectives, respawn points, scoring systems, etc. You have tools that allow you to create liquid, mass-produce balls of clay, or you can set up triggers such as allowing a point to shoot liquid clay if the player is near it. That’s just scratching the surface of the creative mode, that’s not even going into aspects like changing the material/color of the clay you add. One missed opportunity for this game is the exclusion of multiplayer. While the game offers so much to do in its creative mode, imagine the possibilities opened at the thought of creating multiplayer based levels. While this is disappointing, the game at least has a community section where you can download any Claybooks made by other players. This offers up a bunch of worlds to explore and should get your own creative juices flowing. Achievements and an online leaderboard help strengthen the community features. The visuals are sort of a mixed bag. The clay texturing and lighting is great and actually works well on the Switch. When you play these levels, you feel lost in the visual beauty of these clay-built environments. On the other hand, you also have to look at the background as well as a creepy giant child watching over you. I can’t say how many times my enjoyment of the beautiful environments got ruined because I caught a glimpse of the giant child just staring, watching over me with his all-seeing eyes. It makes sense to have the game set in a kid’s room and to have said kid show up from time to time, but neither looks good and it tarnishes the otherwise good visuals the game has going for it. When it comes to creation-type games, they need some quality tunes to keep the monotony at bay. If you think back to classics like Mario Paint and the aforementioned Super Mario Maker there are some really awesome music tracks that make the minutes and hours fade away. Here there’s hardly any variety in the music tracks and when you can spend hours creating levels this becomes a huge issue. You might want to find an external music source to foster your creativity. Also there’s a strange lack of physics throughout the game. For example, when you erase the bottom of a tower it doesn’t just fall to the ground. It stays suspended in the air. This sort of makes sense in the creator mode because you don’t want stuff constantly falling over due to improper balancing. However, when playing levels this can cause unforeseen issues. I had an instance where I had to eat a certain number of objects and I accidentally fell to the ground and ate the bottom half first with no way to reach the top half. This can cause some unfortunate gameplay gaffes. Creative gamers will no doubt find stuff to like in Claybook. The building blocks are here for a fun experience, but it won’t be for everyone. If you like to play games with custom crafted levels this one will not be for you. If you like a sandbox environment where you can experiment to your heart’s content, then you’ll have a blast. Claybook lives up to the creative freedom that it promises, but lacks some polish that it really needed. The creative mode goes above and beyond what you expect from it, with the well-needed community feature. However, the mixed visual quality, lack of music variety, and other small issues should be well noted before you delve into its artistic world.